Not one of the most inspiring views from the bows but at least it is a decent mooring at Slattocks. 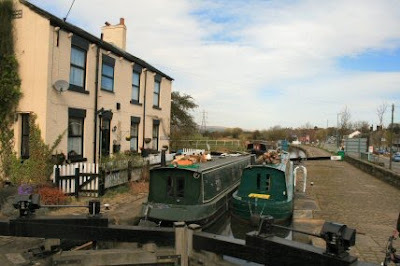 The Hopwood Arms is just a few yards away back up the canal. Very busy when the sun comes out. According to the book Slattocks gets its name from the local dialect version of south locks. The question must be 'How old is the village of Slattocks?'. The canal only dates from 1804 but I suppose it is possible that the reason for it being here at all is through the canal. 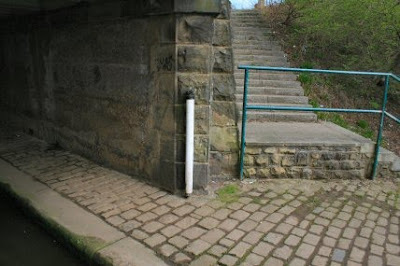 There is a water point on the front wall of the Lock-keepers house. Looking back up the canal one can just make out the start of the Pennine hills. From here till we want to moor for the night is only a mile but there are seven locks in this distance. By the look of things there should be plenty of water. A BW person was about this morning clearing the rubbish from the bywash and it was going through then at a fair rate of knots. At one of the bridges they have resited one of the old rollers that help to preserve the stonework from the ropes that in other places make large grooves in the wall. In the middle of the five locks that are very close together. 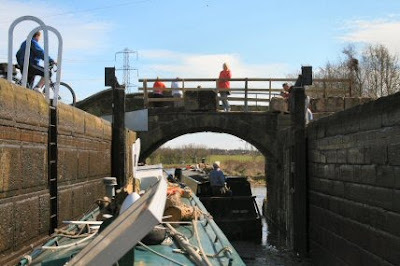 As is usual as soon as a boat goes through a lock the walkers turn up to gaze. We turned this to our advantage by asking if they would close the gates for us. The last lock and some of our temporary assistants for the day about to close up the gates. And finally the mooring today. 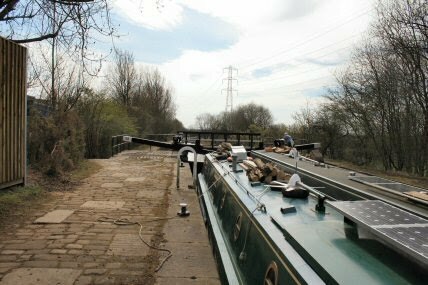 We still have three more locks to go through before the mooring at Chadderton. We will be here till its time to head off to Manchester. 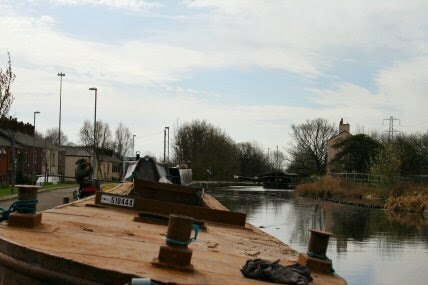 It is a long slog with very few places to moor safely and so its seven miles long and twenty locks to get through in a day. 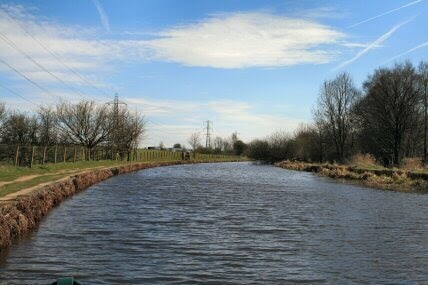 There is a safe mooring at the end of it then yet another slog up through the Aston canal. More bandit country and to be avoided at weekends and school holidays. Then it will only be four miles and eighteen locks to the end. The locks are closed up tight at night and in the case of the Manchester to Chadderton section only four boats a day are allowed each way.